It can be easy to overlook TriMet bus, MAX and streetcar operators who work hard to give people safe, dependable transit service in the Portland metro area every day. You’ll have a chance to officially thank them Friday, March 18, during Transit Driver Appreciation Day. Join TriMet in celebrating the nearly 1,500 operators who provide service to 6,637 bus stops on 79 lines, 97 stations on five MAX lines and 77 stops on Portland Streetcar. They help connect people with our region by providing more than 100 million trips per year—two million per week—for a transit service that runs 22-and-a-half hours per day, every day. There are other ways to show your appreciation besides giving a friendly wave and smile. Visit transitdriverday.org to download and personalize a thank-you card for your driver. You can also add your story online at trimet.org/tdad. On social media, be sure to use the hashtag #tdad while you post a positive comment on Facebook . And you can always submit an official commendation at trimet.org/thanks for a job well done, so your drivers are formally recognized for their efforts. You can do this any time of the year! Watch this video to see some of our riders thank our operators. 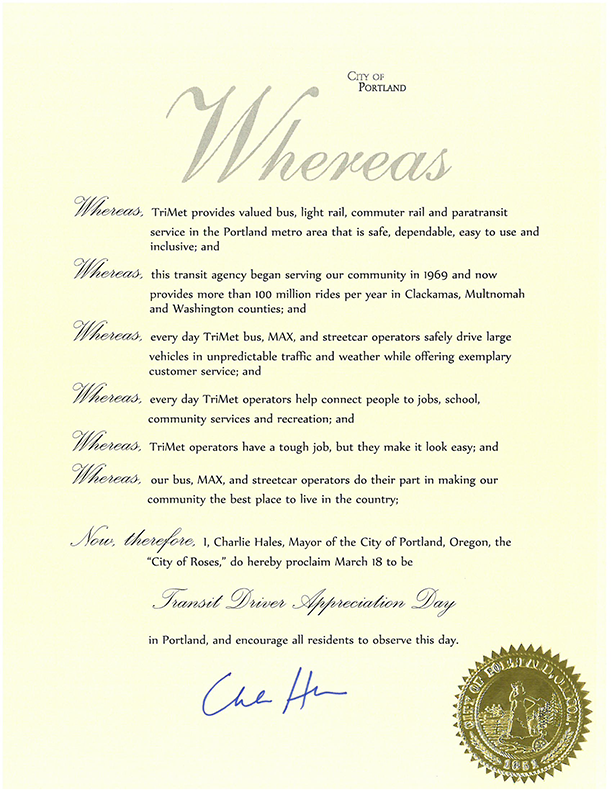 Portland Mayor Charlie Hales has issued a proclamation this week officially declaring March 18 Transit Driver Appreciation Day, from this day forward, to perpetually recognize the hard-working bus and rail operators in our community. March 18 is the same day that bus service—horse-drawn vehicles, actually— is believed to have debuted in Paris in 1662. TriMet began Transit Driver Appreciation Day in 2012.